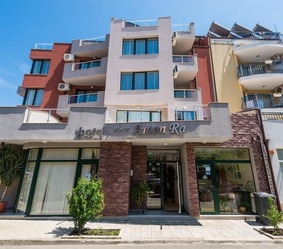 Location: Amon Ra Family Hotel is situated in the new part of Sozopol, just 50 meters from Harmani beach. Bars and restaurants: The hotel offers restaurant with panoramic terrace. The restaurant serves dishes from the Bulgarian cuisine. Facilities: There is Wi-Fi internet access in the hotel.